Before setting out on the hike, I had looked up practically everything on the internet about the hike to Concordia, the acclaimed ‘throne of the mountain gods’. I wasn’t too happy with the information available on the internet, so I wanted to write a comprehensive article on the whole experience. Eight months later, that article remains unwritten, and after much head scratching, the simple answer is that words can’t do the experience justice.The pictures of the trip, while certainly nice, and some are downright amazing, fall short. So instead of a article, the following pages contain my notes from the my diary of the hike. This was my first major hike, and it’s made me into a convert – I plan to go explore as much of the world as I can by human powered means – really, it’s the only way to see the world. The plan is simple: Hike to K2 base camp, and back over the Gondogoro LA pass!! 26th June if all goes well we take the flight to Skardu – so stands the plan. You can see our initial plan here. The ghutter gou, ghutter gou call of pigeons carries me into another dimension. An instant calm descends as I park my jeep and walk down a dirt path, through the wrought iron gates of a tiny green domed, white washed building which stands at a slight angle in its grounds. I have seen it from afar, a deep green, jumping out of the golden brown stretch of land that is being developed at break neck speed. A tiny mazar, I presume, like the many small ones that dot Karachi. 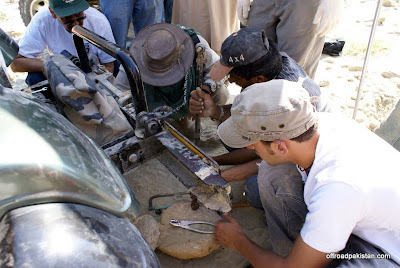 Jay’s 2006 Pilgrimage to Hingula Devi in Balochistan, Pakistan from offroadpakistan on Vimeo. Road trips don’t require much preparation, but 4×4 trips off the beaten track are a different thing altogether. There is no help available off the highway, so the vehicle has to be in good shape and the driver must be well prepared to deal with any eventuality. Of course, the idea is to avoid breakdowns in the first place, so a number of things have to be looked at when setting out on a 4×4 trip out into the wild. Soon after we got married, my wife Sabiha asked me to get a Ford F1 truck for her. I tried my best but could not find any in Pakistan. Some thirty years later, on one of her visits to America, she found one in a small town called Dry Town near Sacramento, California. She convinced the owner to sell it to her and I think she got it for $140 (exact amount she has not told me – only that it cost more to have it towed to our friend Javed Akber’s house in Sacramento). Till we could figure out how to have it shipped to Karachi, for over a year the Ford truck remained parked in Javed’s garage (while their own two cars remained out in the open). i.e frequently asked questions about the Hingol. We’ve missed quite a few, so feel free to add your question in the comments, and we’ll update this FAQ soonest. Read on…. Here’s is how it all started for me. Ever since my childhood I’ve been riding in Jeeps and dreaming about them. After reading volumes of illustrated War history books, I spent hours in my uncle’s CJ-3A imagining myself to be a World War II soldier. A few years later my father bought my eldest brother his first Jeep. It was a Willy’s M38. I still remember that day; it was our very first Jeep. The following article is the elaboration of a post that I made in the forums a while ago. My good friend KO insisted I turn it into a tech article as a reference for those who are not regular visitors around here. The very first car built & registered in Pakistan. Just outside Karachi in any direction is some marvelous sightseeing country. Most people living in Karachi do not wander far from the city, at most to the beach and back. Those who do travel, go further away to other cities, or all the way north to the mountains. Like just about any large city, the surrounding areas of Karachi have a lot to offer. I first published this article back in 2003 when the petroleum pricing structure in Pakistan was completely different from present day and hence the engines available locally were also accordingly different. With the recent alignment of Pakistani petroleum prices with global oil prices, gasoline engines have quickly become a less expensive and often more desirable alternative to diesel engines. I have reproduced the article in more or less its original form, albeit updated where appropriate to reflect engine options now available in light of this development. In Pakistan, there is a considerably limited choice when it comes to choosing a 4×4 vehicle. The major types are listed below, with a short description and rating for each vehicle. With the older 4×4’s, their off road prowess depends mainly on their owners, while with the newer 4×4’s, it’s mostly up to the vehicle as it cannot be modified much. With these old jeeps, it’s the driver that’s the most important part of the drivetrain, which is what makes them so much fun off the road. The following jeeps are rated according to Pakistani terrain, where we hardly ever see any mud. We’ve got rocks, more rocks, even bigger rocks, and lots of fine sand! Most of the local jeeps would do terribly in deep mud, so luckily there isn’t any! 4×4 low range can compensate for lack of power in any terrain, but with mud you need raw power coupled with fast throttle response. 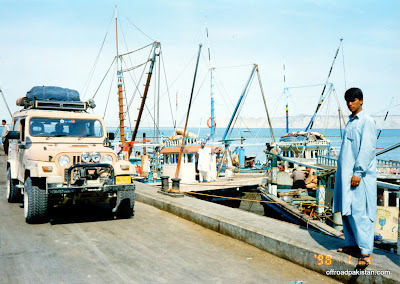 KARACHI: I have just got back from a 7-day, 3,000-kilometre trip through the coastal and southern region of Balochistan. There were 24 of us, in seven jeeps – all tried and tested members of a Karachi-based off-roaders club, people who scorn paved roads and are happiest when trundling along uncharted dirt tracks, preferably in low gear. Our journey took us from Karachi to Aghor Camp on the Hingol River, from there through the wonderfully named Buzi Pass to Ormara, then via Pasni to Gwadar, from there to Turbat, the headquarter of Makran division, and on via Hoshab to Panjgur, Awaran, Jhal Jhao, Bela and back to Karachi.